In the magical Christmas night “Christmas balls” can not only hang on your tree, but also to stand on your Desk. The main feature of this tasty snack is prepared easily and quickly. The products are available and useful. It is also important that this dish will serve as a Desk decoration. • mayonnaise or other sauce to taste. Chicken breast washed from contamination, put in boiling salted water and cook for 15-20 minutes. Take out, cut cooled meat into small cubes. Cheese RUB on a small grater. Parsley and dill wash under running water, pour over boiling water and finely chop. 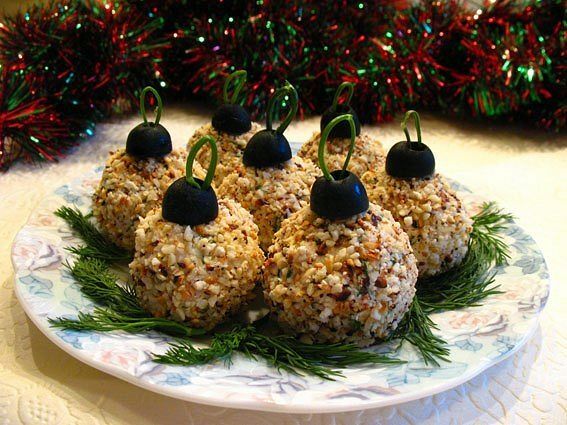 Walnuts grind in a mortar or blender and leave to obvalivanie balls. All components are mixed, the resulting mixture is extruded garlic to taste and stir again. Mayonnaise. Leave for 20-30 minutes to absorb. The resulting mixture formed the balls, coat them in crushed walnuts. 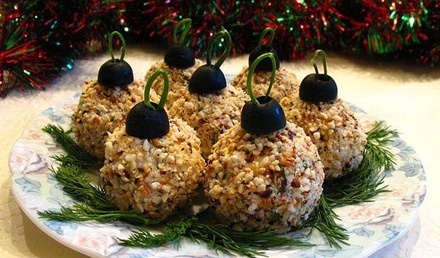 Olives cut and decorate the balls as shown in the photo. From the stems of greenery make the loops on our “Christmas tree balls”. Why is important to cook this dish in new year’s eve? Reasons why we recommend the appetizer “Christmas balls” somewhat. • Ease of preparation. It is not necessary in this day to give it my all culinary delights. You need to take time for yourself and relax before the celebrations. So choose recipes that do not require to prepare a lot of time and effort. • The dish is high in calories. Your guests will not go hungry, and family members will not be constantly running to the refrigerator. • Appetizer is delicious, and her beautiful appearance gives you an appetite. The dish will serve as a table decoration, will be another highlight the charm of new year’s eve. • B vitamins have a positive effect on the nervous system, strengthen immunity and help the body to resist all kinds of infections. They improve the functioning of the liver, gastrointestinal tract and cardiovascular system. Have a great impact on the normalization of view. • Vitamin E called the vitamin of youth and beauty. It improves the condition of skin, teeth and hair. • Vitamin C – strengthens the capillaries, stimulates the immune system, are indispensable in the implementation of the acid-alkaline reactions in the body and improves the functioning of liver and kidneys. In walnut kernels 75% vegetable fat required for absorption of fat-soluble vitamins. Polyunsaturated fats omega regulate hormonal balance in women. They are good for the liver, heart and brain removed from the body of radiological substances. Walnut is considered food scientists and heroes. Amino acids needed for protein synthesis, can be introduced into the body by eating this product. Proteins of plant origin, and 15%, easily absorbed by the human body. Fats have a positive effect on the growth of bones and muscles, healthy tooth enamel. In any other kind of nuts there is so much antioxidants that make chemical reactions in the body occur with maximum effect, and aging processes slow down. Definitely need to use walnuts for people with diseases of the heart and cardiovascular system, and also with the purpose of prevention. Such effects on the body due to the presence of trace elements: phosphorus, magnesium and potassium.